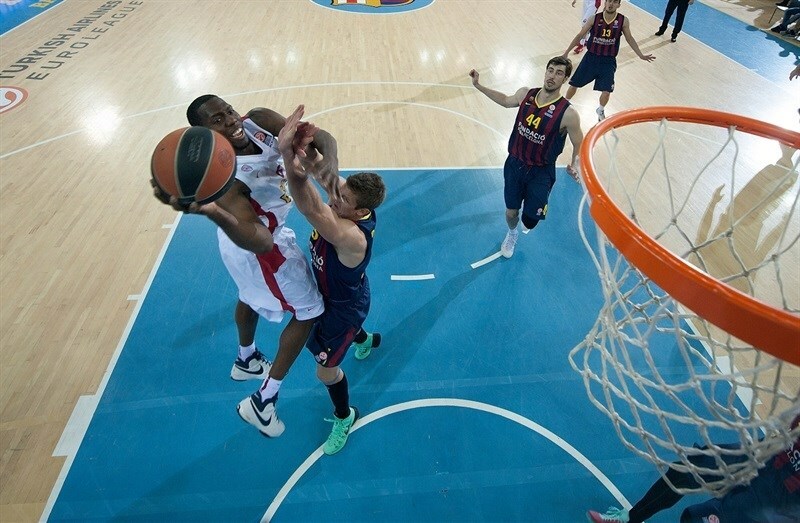 FC Barcelona took a 1-0 lead in its best-of-five playoffs series by downing Olympiacos Piraeus 73-57 at home on Wednesday. Barcelona struck first in the series and hosts Game 2 on Friday. 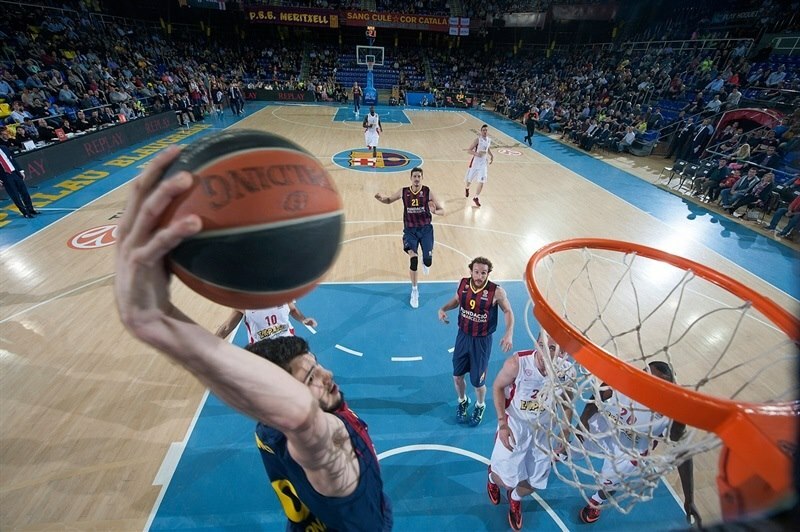 This win was Barcelona’s ninth in a row in the Euroleague. 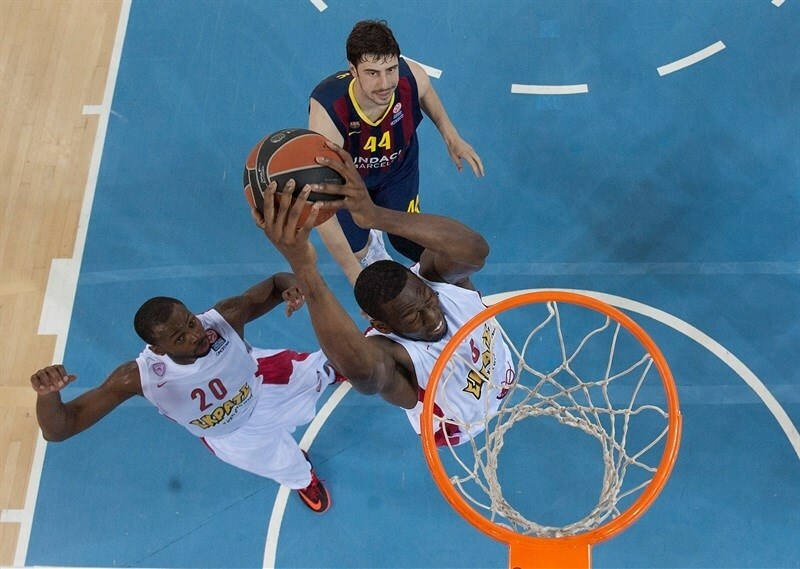 It also marked the eighth straight home win for Barcelona against Olympiacos. 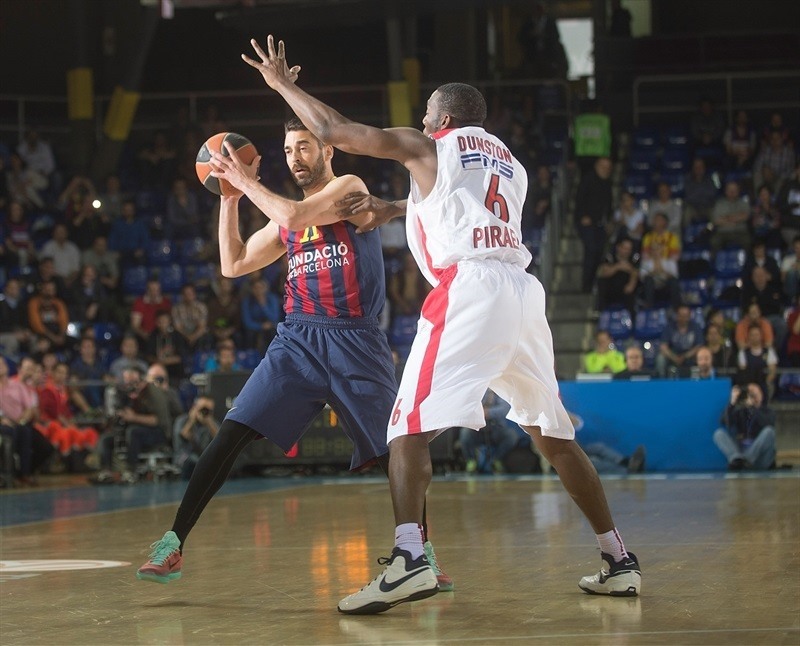 Juan Carlos Navarro and Bostjan Nachbar each scored 10 to lead a balanced Barcelona attack. Maciej Lampe posted 8 points and 9 rebounds as the hosts dominated the boards 44-27. 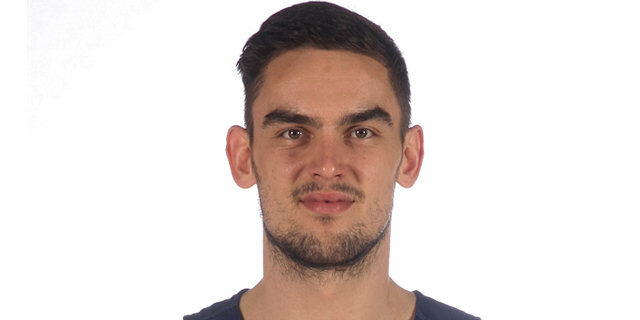 Dimitris Agravanis led all Olympiacos scorers with 9 points. Olympiacos had a strong start and a jumper by Georgios Printezis gave the Reds a 3-6 lead. Barcelona improved its defense, as Tomas Satoransky and Lampe fueled a 19-2 run highlighted by Marcelinho Huertas's incredible three-pointer at the end of the first quarter. A triple by Nachbar made it a 15-point game early in the second quarter. 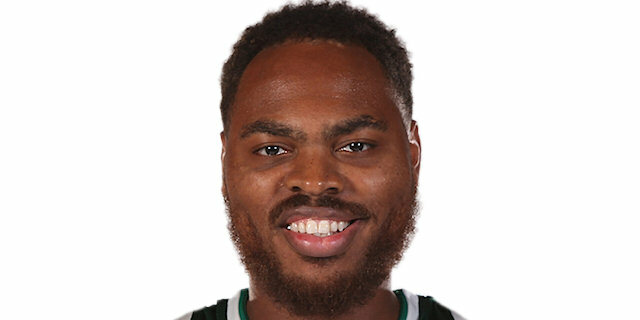 Brent Petway and Kostas Sloukas stepped up for Olympiacos and a dunk by Matt Lojeski brought his team within 35-26 at halftime. Navarro took over after the break, as Barcelona kept excelling on defense to extend its margin to 50-38 at the end of the third quarter. Nothing changed from that moment, as Nachbar downed consecutive three-pointers to seal the outcome, 61-42, long before the final buzzer. 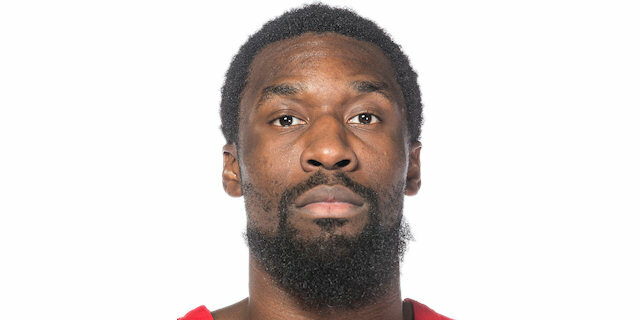 Printezis got Olympiacos going with a fast break layup and a close basket by Bryant Dunston soon gave the Reds a 1-4 lead. Navarro took over with a running hook before Printezis nailed his trademark one-handed jumper off the baseline, as Olympiacos struggled to get Vassilis Spanoulis involved due to Satoransky's strong defense. 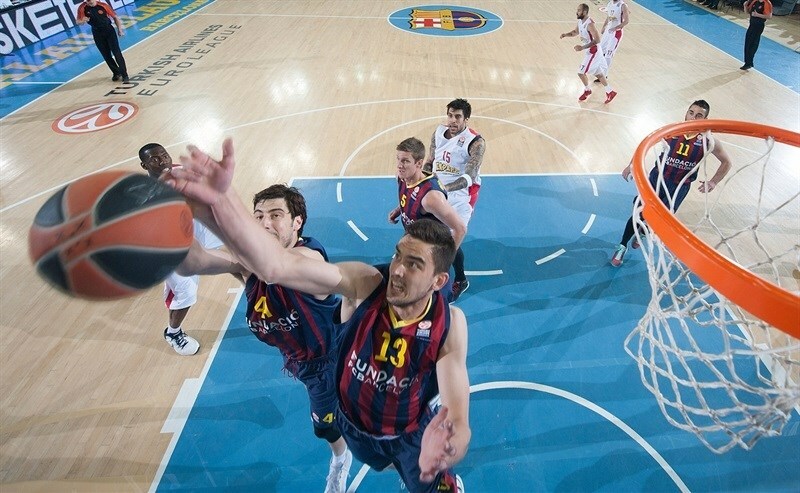 Navarro hit a step-back jumper and a dunk by Ante Tomic gave Barcelona a 7-6 lead. DeShaun Thomas finished a three-chance Barcelona offense with a big slam and added a jump hook off a timeout for 5-point advantage. Olympiacos could not find the way to the basket. The Reds were held scoreless for more than six minutes, while a three-pointer by Satoransky capped an 11-0 Barcelona run for a 14-6 lead. 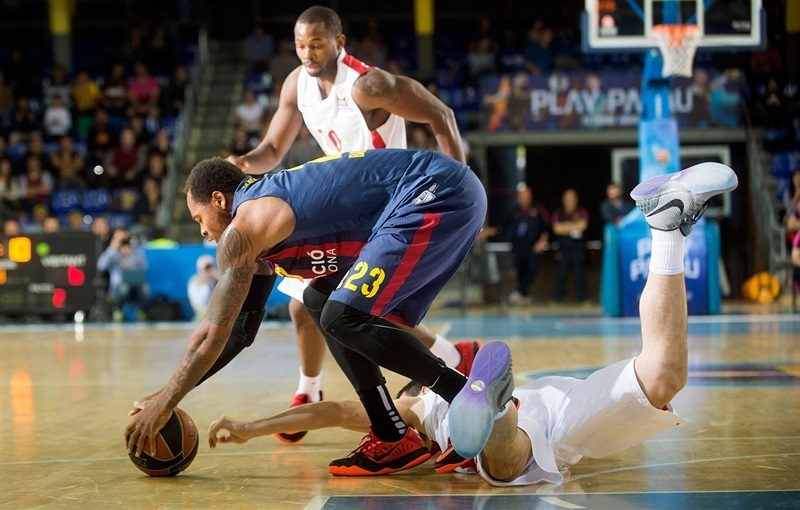 Agravanis rescued Olympiacos with a layup, which Brad Oleson bettered with a triple. Marcelinho beat the buzzer with an unbelievable circus shot from downtown for a 20-8 Barcelona lead after 10 minutes. 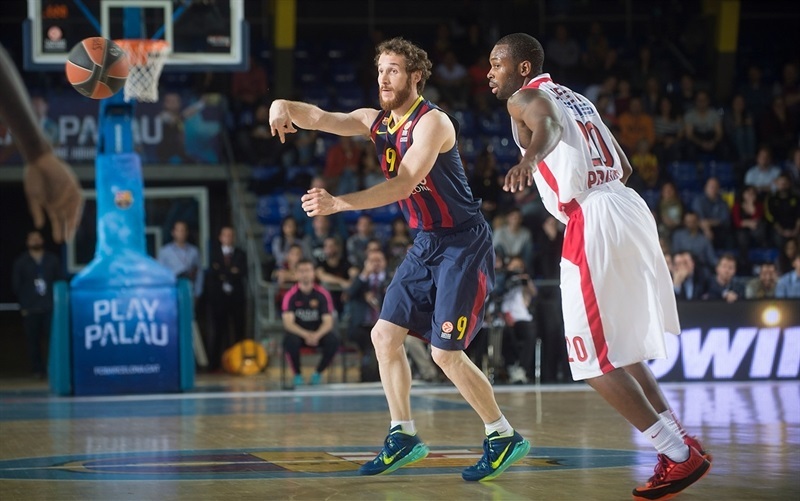 Oleson kept pushing Barcelona with a wild driving layup early in the quarter. Sloukas tried to ignite the guests' comeback with free throws, which Nachbar improved on with a catch-and-shoot triple for a 25-10 Barcelona advantage. Vangelis Mantzaris struck from downtown and a layup by Brent Petway gave Olympiacos hope at 25-15. 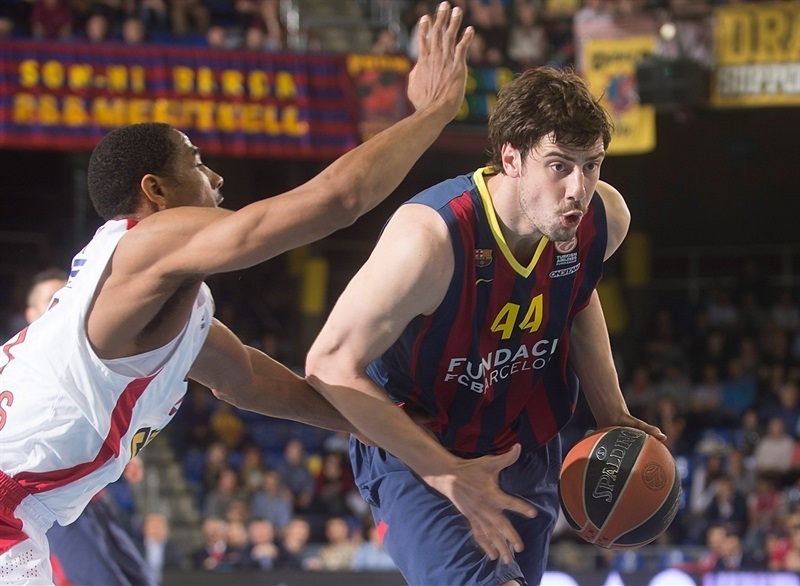 Tibor Pleiss stepped up with a dunk and matched Petway's six-meter jumper with a layup. Mantzaris and Sloukas split free throws, bringing the Reds within single digits, 29-20. Maciej Lampe shined with a put-back basket, which Dunston erased with a layup. 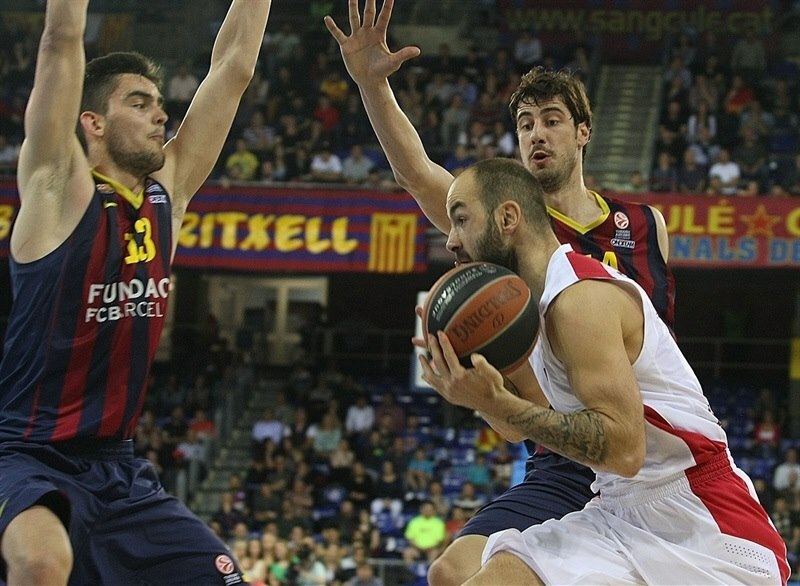 Spanoulis split foul shots - his first point - and Satoransky set a 32-23 Barcelona margin. After Lampe made free throws, Dunston and Tomic split attempts and a fast break dunk by Matt Lojeski fixed the halftime score at 35-26. Navarro struck from downtown immediately after the break, as Barcelona held the guests scoreless for more than two minutes. A three-pointer by Satoransky boosted his team's lead to 41-26. Tremmell Darden hit a six-meter jumper and Lojeski buried one from beyond the arc to bring Olympiacos a bit closer. The Reds tried a more athletic frontcourt with Petway and Othello Hunter. Satoransky took over with a driving layup and Navarro nailed an eight-meter bomb that broke the game open at 46-31. Hunter split foul shots and Pleiss soon made it a 16-point game. 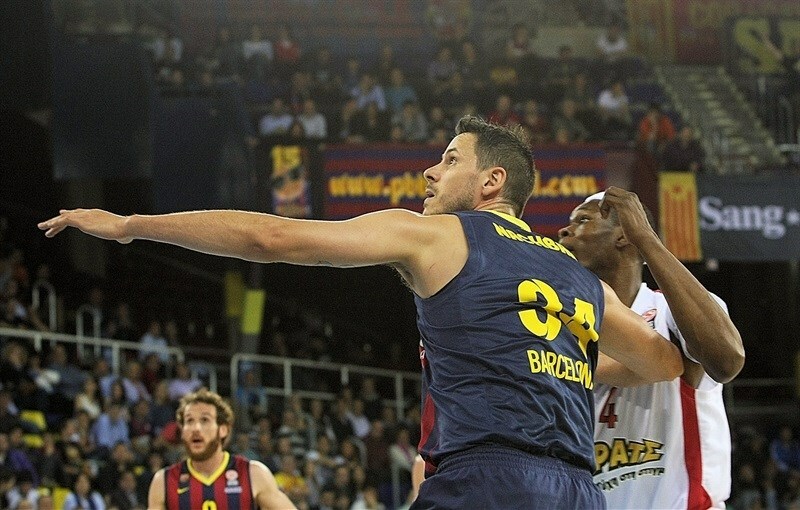 Ioannis Papapetrou struck from downtown, as Barcelona started to use longer possessions now. Lampe made free throws and Agravanis bettered him with a triple to make it 50-38. Olympiacos needed a quick comeback to return to the game and tried a more dynamic backcourt with Lafayette and Sloukas together on court. Lampe hit a jump hook, which Slouks erased with a driving layup and a step-back jumper by Papapetrou gave Olympiacos hope, 52-42, with eight minutes left. Tomic split free throws and added a layup, which caused the Reds stop the game at 55-42. Back-to-back three-pointers by Nachbar sealed the outcome at 61-42 with less than six minutes remaining. Olympiacos called another timeout and tried to play more physical. Hunter shined with an alley-oop layup and Oleson left the game with an ankle injury. Lafayette made free throws, but Mario Hezonja did better with a three-point play. Just as always, Olympiacos never gave up, but the Barcelona fans had plenty of time to celebrate a very important win. "I am happy with this win. It was difficult to get into the game, as happens in these kind of showdowns. We missed some easy shots, but played excellent defense all game long and controlled the boards. We were the fair winners of this game. I am happy and looking forward to Friday's game. We will need our fans; it is a critical game for our future in the competition. It is soon to talk about Oleson's injury, he will undergo some tests tomorrow. It will be difficult for him to be able to play on Friday. Olympiacos is a very tough team and we finished 22-20 in fouls. They are really tough, especially in double teams and switches on defense. They managed to limit us to fewer possessions than usual. We were smart - 13 turnovers and 15 assists are good numbers against them. It is really difficult to control the rebounds against them, but we managed to do it and I congratulate my players for that. They have great offensive rebounders, but we did a good job on defense. We could have played a little bit better on offense, but globally speaking, the game went the way we planned it. Each game is different and Olympiacos is one of the toughest teams in Europe. We have to be calm against them and at least match their intensity level. We managed to play with that calm we needed in tough situations, control our emotions and focus on the game, not in anything else we cannot really control." "Congratulations to FC Barcelona, they deserved the win. We started the game really well in the first three minutes, offensively and defensively, but after that, we lost our concentration mainly on offense. We didn't move the ball as we planned to and didn't read the game well on offense and the fact that we didn't score hurt our concentration and fighting spirit on defense. Also, our defense allowed 6 offensive rebounds in the first quarter and 6 more in the second quarter, which is a big minus for us. 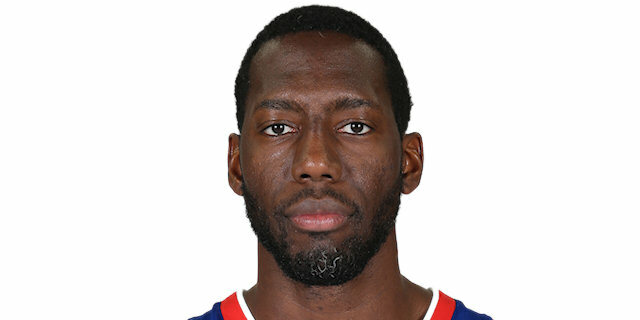 When you allow 12 offensive rebounds and are down double digits, it is very difficult to come back. We tried to do a few things during the game. Defensively, we improved on rebounding, allowing 3 offensive rebounds in the second half. But we carried on not reading the game well and making bad decisions. We didn't play as a team and lost the game due to bad offense. For sure, we can play better. We need to change our mentality and be ready for the next game." "Game 1 is always very important because winning it gives you a lot of confidence. It will be a very long series and this is just the first step. 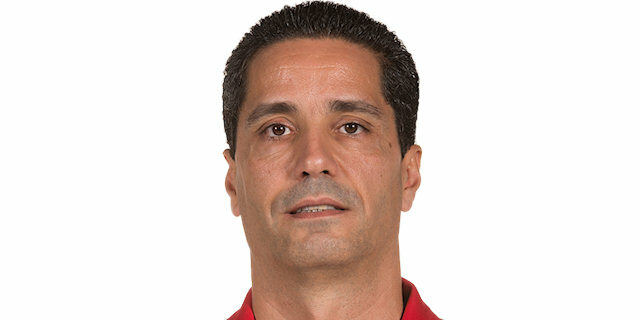 Olympiacos is a tough team mentally speaking and I am sure Game 2 will be a more difficult one. They will be a different team, I am sure. I tried not to think too much about how important the game was. It is my first Euroleague season and everything is going fast for me. I believe that we prepared the series well and are happy for this first win, but we are still far away from winning the series." "Individually and as a team, we had a great start to the game. Coach expected out of all of us, and expected out of me, to be aggressive. That was not just the key to the game, it was just the focus and determination out of all of us as a team to be ready for this game. It was a great first half. My teammates kept me going, and it felt good. We did not know them really well, but we actually prepared pretty good for them, and they did not know us really well. Now they got a little feel for us. I expect the second game to be a little different, a little tougher. But this is what basketball is all about - just staying focused and competing." "It was not a good start at all. We talked about coming out and being aggressive, and playing with confidence, but we did not do that at all. Not in the first quarter, pretty much throughout the entire game we were playing too loose. For a type of game it was supposed to be, we did not have the right mindset. First we have to play defense, then play together as a team and share the ball. Once we move the ball, guys get open shots. Confidence goes up, defense gets better. That’s how we have been playing the whole season, so we just have to do that." "We just got to start playing together as a team. It wasn't us. I would say after the first three minutes of the game, we played good, but after that just we did not look like us. Everybody could tell. My injury is gone. I feel perfect. I need to do some things personally to get back into it, and get ready for the next game."